stevie Gets Thumped . . . .
Today's vote in the House of Commons is not what mr. harper was hoping for, I'll wager . . . .
Ch, Ch, Ch Changes . . . .
Bear with us while we change the appearance - hopefully not the content! - of our blog. Hope you approve . . . .
And speaking of Condescending, here's Keith Olbermann's "Special Comment" from last night's show . . . Scathing, but accurate. Maybe it's time I left ms. rice alone for awhile. It's not easy, though. Every time she opens her mouth it's such an easy mark . . . .
Condescending and Peter Redux - No Good Can Come of This . . . .
U.S. Secretary of State Condoleezza Rice was in Ottawa yesterday for security and prosperity meetings with eight other ministers from Canada, Mexico and the U. S. The ministers, which included Foreign Affairs Minister Peter MacKay, Public Safety Minister Stockwell Day and Industry Minister Maxime Bernier, also received a broad 51- recommendation report from a panel of business leaders from all three countries that focused on enhancing energy security and production, harmonizing trade regulations and speeding goods and people across their borders in the post 9/ 11 environment. As it presented its report, several members of the North American Competitiveness Council went to great lengths during a press conference to stress they were not trying to subvert the sovereignty of any country with its broad set of recommendations. “ We’re making business recommendations. We’re not making recommendations on government policy. This goes to your ministers and parliaments,” said Ron Kovais, a top executive with the leading U. S. defence contractor, Lockheed Martin. Somehow the statements in bold (emphasis mine) don't give me a warm, fuzzy feeling. You? ? ? ? "Deep Integration" Finally Covered in MSM . . . .
Blogland has apparently brought the MSM kicking and screaming to the "Deep Integration" story. This from today's CanWest News Service. UPDATE: Here's a link to the Timeline of the Progress Toward a North American Union compliments of Vive le Canada. It is an excellent chronology of events leading towards the current situation. NDP Opposes "Deep Integration" . . . .
OTTAWA - The Harper government must pull out of further talks on continental integration with the United States and Mexico or risk our national sovereignty, says NDP Trade Critic Peter Julian (Burnaby-New Westminster). Julian commented in advance of the February 23 meeting to be held in Ottawa where American and Mexican officials will join Canadian cabinet ministers to push forward the so-called "Security and Prosperity Partnership" (SPP) agenda. Julian was joined by NDP Energy Critic, Dennis Bevington (WesternArctic). Julian denounced the sellout of Canada. "The previous Liberal government engaged Canada in a slow merger process with the United States and Stephen Harper is accelerating the agenda," said Julian. "The NDP demands a full debate in Parliament on this issue. Everyday Canadians have the right to know what is being negotiated." Changes to some 300 policy and program areas are being promoted as benign "efficiency" measures. The ongoing extensive consultations in the SPP process will lead to an unacceptable level of regulatory harmonization with the surrender of Canadian energy, immigration, health care, food safety, and environmental policies and to complete military integration with the US. "Canada is not the gas tank of the United States. NAFTA already locks us into supplying energy to the United States even if ordinary Canadians go without; a North American Union would only make this worse," said Bevington. "Canadians should know that the SPP process supports a North American Union (NAU). The NDP rejects the secretive process surrounding these ongoing discussions. Canadians will never support a political ideology which aims at turning North America into a fortress for corporate interests and neglects the interests of ordinary Canadians. Canadian sovereignty is not for sale to the highest bidder and the federal government has no authority to push for a NAU without a mandate from Canadians," said Julian. Julian reiterated the NDP's full support for civil society demands that North American leaders discuss issues vital to the public interest: the growing prosperity gap in Canada, Mexico, and the US; the need for guarantees of universal access to public health services; and for immediate joint efforts to combat global warming rather than North American Integration. We hope Canadian citizens contact their elected officials to oppose any further advances of the "Security and Prosperity Partnership" . . . .
Future Prime Minister vs. Current Prime Minister . . . . Who Knows? 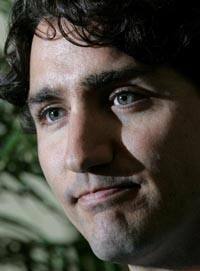 Justin Trudeau will seek the federal Liberal party nomination in Montreal's Papineau riding, according to Radio-Canada. The eldest son of former prime minister Pierre Trudeau, the late Liberal prime minister, will attempt to jump into politics in a riding currently held by Bloc Québécois MP Vivian Barbot. The riding was once a Liberal stronghold, where former foreign affairs minister Pierre Pettigrew was elected three times. Oh, and BTW, as of this posting the current PM during Question Period is still refusing to apologize for or retract yesterday's comments about the Liberal MP from Ontario and the 1985 Air India bombing. It appears "shrub" has learned well from "bush" about how to ignore rational thought and ignite his opponents . . . .
Don't Have a Chance . . . . The Feb. 9-11, 2007, poll asked Americans whether they would vote for "a generally well-qualified" presidential candidate nominated by their party with each of the following characteristics: Jewish, Catholic, Mormon, an atheist, a woman, black, Hispanic, homosexual, 72 years of age, and someone married for the third time. Between now and the 2008 political conventions, there will be discussion about the qualifications of presidential candidates -- their education, age, religion, race, and so on. If your party nominated a generally well-qualified person for president who happened to be …, would you vote for that person? Since I fall into the two last categories, my chances of being elected US president are not good. Great News From Two Moms to Canada ! ! ! ! Two Moms to Canada are in ! ! ! ! Congratulations and we can't wait to follow in your footsteps! Our letter from the New York City consulate office stated "do not request status of this application within 90 days of the date of this letter." Needless to say, when my Palm Pilot beeped to remind me of the 90 days passing, I fired off an email to our immigration attorney's office requesting them to find out what's going on. We started processing your application on November 7, 2005. We transferred your application to the New York office on November 15, 2006. The New York office may contact you. Our processor sent a fax to the consulate to inquire if they needed further information, etc. Hopefully this will spur them to at least take a look at the file. Can you tell I'm getting a little anxious for some news? ? ? ? And in Honour of President's Day . . . .
Our great country has had 43 presidents. Many very good. A few pretty bad. On Presidents Day next Monday, it's appropriate to commemorate them all. I remember every president since Herbert Hoover, when I was a grade school kid. He was one of the worst. I've personally met every president since Dwight Eisenhower. He was one of the best. A year ago I criticized Hillary Clinton for saying "this (Bush) administration will go down in history as one of the worst." "She's wrong," I wrote. Then I rated these five presidents, in this order, as the worst: Andrew Jackson, James Buchanan, Ulysses Grant, Hoover and Richard Nixon. "It's very unlikely Bush can crack that list," I added. I was wrong. This is my mea culpa. Not only has Bush cracked that list, but he is planted firmly at the top. "Shock and Awe," early 2003. "Mission Accomplished," May 1, 2003. "Stay the Course," June 2003, 2004, 2005, 2006. Another term historians may weigh critically is "Decider." Is he just a self-touted decider doing what he thinks right? Or is he an arrogant ruler who doesn't care or consider what the public or Congress believes best for the country? Despite his play on words and slogans, Bush didn't learn the value or meaning of mea culpa (acknowledgement of an error) during his years at Yale. Bush admitting his many mistakes on Iraq and ending that fiasco might make many of us forgive, even though we can never forget the terrible toll in lives and dollars. "Just as we don't stop football games after three quarters, we shouldn't judge the historical place of presidents when they've still got nearly two years in office." "Unless there is some great reversal, Bush will be seen as one of the country's poorest presidents. Iraq will stand at the top of the list, but the administration's failed responses to Katrina and global warming will stand with its abuse of civil liberties to mark Bush out as a man with poor judgment and a failed leader." — Robert Dallek, historian; his new book, Nixon and Kissinger: Powers in Power, will be published in April. At least "w" is at the top of a list for something . . . .
700 Club . . . .
Today marks 700 days left of the bush administration . . . . That is, unless he declares martial law and remains in power, of course. I wonder how much more damage he can do to the US before he leaves office? Makes one shudder . . . .
Fox News People Really Are Annoying . . . . Does anyone have information on what military service or time spent in Iraq Brit Hume of Fox News has in his biography? Why don't the Fox "experts" just shut the #! ?& up? Happy Lunar New Year . . . . In China, the Boar ( 豬 ) is associated with fertility and virility. To bear children in the year of the pig is considered very fortunate, for they will be happy and honest. LUNAR NEW YEAR: Calligraphy master Feng- Tzu Chan created this set of New Year’s banners for Vancouver Sun readers. Left, it says, The world at peace, people at peace, 10,000 things all at peace. Right, The heavens in harmony, the Earth in harmony, the sun, the moon, the stars in harmony. 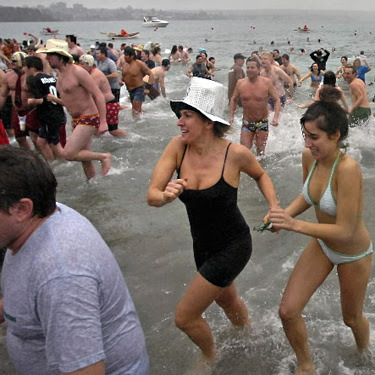 This in contrast to the traditional January 1st New Year's celebration in Vancouver - The Polar Bear plunge into English Bay . . . .
Definitely different strokes for different folks . . . .
bush slight to shrub ? ? ? ? "For NATO to succeed, member nations must provide commanders on the ground with the troops and the equipment they need to do their jobs. Many allies have made commitments of additional forces and support -- and I appreciate those commitments, but * nearly as much as the people in Afghanistan appreciate them. Norway, Lithuania and the Czech Republic have all agreed to send special operation forces to Afghanistan. Britain, Poland, Turkey and Bulgaria have agreed to additional troops. Italy has agreed to send aircraft. Romania will contribute to the EU police mission. Denmark, Greece, Norway and Slovakia will provide funding for Afghan security forces. Iceland will provide airlift. The people of Afghanistan need to know that they've got a lot of friends in this world who want them to succeed." "And in the past year, nations including Denmark, Italy, France, Indonesia, Jordan, Malaysia, Turkey, Canada, and Britain have broken up terrorist cells. The enemy is active, and so are those of us who love freedom. It's in the interests of the United States to encourage other nations not to relent and not to give in, but to keep the pressure on those who try to have their way by murdering the innocent. And that's exactly what we'll continue to do." Do any Canadian political leaders - mr. harper, particularly - feel a bit taken for granted by the bushies? A Platoon of Lesbians to the Rescue After All . . . .
An official from the U.S. State Department called Rep. Gary Ackerman’s (D-N.Y.) office Feb. 7 to tell him they were considering his suggestion to rehire some of the gay linguists discharged from the military under the Defense Department’s “Don’t Ask, Don’t Tell” policy. 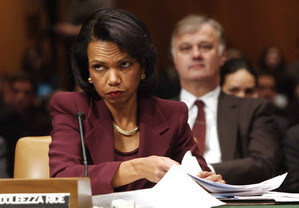 Ackerman, a member of the House Foreign Affairs Committee, and Secretary of State Condoleezza Rice discussed the issue during the State Department’s 2008 budget hearing on Feb. 7. During her testimony, Rice expressed concern about the lack of qualified linguists in the armed forces. Ackerman, a longtime opponent of “Don’t Ask, Don’t Tell,” suggested having the State Department hire back gay linguists, because unlike the Defense Department, it doesn’t have such a policy. the military has quadrupled the number of employees in the critical languages area, but that they would like to train them to higher levels of competence. Ackerman used the hearing to humorously address homophobia in the military. Should those homosexuals terminated because of their lifestyle be expected to "forgive and forget" and come running back to save the administration that canned them?? That would be a decision requiring a lot of thoughtful contemplation . . . . The More Things Change, the More Things Stay the Same . . . .
Homophobia is still out there, gang . . . .
John Amaechi is the first NBA player to publicly declare he's gay. It never ceases to amaze me what thoughts are rumbling through some people's minds . . . .
Sweet, Sweet Revenge . . . . The Dixie Chicks swept up five Grammy Awards, including record of the year and album of the year at Sunday night's music industry gala in Staples Center in Los Angeles. It was an ironic twist for the singers, who were shunned by country stations and dropped by many of their fans after lead singer Natalie Maines criticized U.S. President George W. Bush during a London concert three years ago. Maines quipped, "I'm ready to make nice!" when the group went up on stage to accept the album of the year award for Taking the Long Way. But she added: "I think people are using their freedom of speech with all these awards." The political heat the group took from country fans, even after Maines apologized for the remarks, was the subject of a documentary, Shut Up and Sing. But they appear to have bounced back from political purgatory into the warm embrace of the music industry with their Grammy haul, which included best country album for Taking the Long Way and song of the year and record of the year for Not Ready to Make Nice. Not Ready to Make Nice also won the country trio a Grammy for best country performance. "Thank you for helping us to get all this out and into a song," Emily Robison of the Dixie Chicks said in thanking songwriter Dan Wilson for his work on the song. "Our core fans have always stayed true to us. We have no regrets," Robison said. You can view their Grammy appearance here - Courtesy of Crooks and Liars - complete with an introduction by Joan Baez. Sweet . . . . Sometimes nice girls do finish first!! "Stealth" Meeting Confirmed . . . . This meeting has been referenced here and here in previous posts. Now, thanks to Kelly Patterson of CanWest News Service and the U.S. Freedom of Information laws, the rumoured "Deep Integration" meeting has been confirmed. OTTAWA — Canadian, U.S. and Mexican politicians discussed using “stealth” to head off public resistance to the integration of the three countries at a confidential meeting last year, according to documents just released under U.S. Freedom of Information laws. Top military brass, corporate executives and diplomats also attended the meeting in Banff, Alta., where participants discussed everything from the harmonization of food and drug standards, to common immigration policies, and the pooling of energy resources. The secret guest list of the North American Forum included then-U.S. secretary of defense Donald Rumsfeld, Canadian Chief of Defence Staff Gen. Rick Hillier, Public Safety Minister Stockwell Day, Pengrowth Corp. CEO James Kinnear and Lockheed Martin executive Ron Covais. Presentation outlines, obtained by Judicial Watch, a Washington-based conservative watchdog group, acknowledge that the concept of North American integration — which some call a “North American Union” — is unpopular, and note that it might be tough to sell as a concept. “Working on the infrastructure might yield more benefit and bring more people on board [‘evolution by stealth’],” the notes said. “Evolution by stealth” means using regulatory changes, such as food- and drug-safety benchmarks, which don’t require parliamentary approval, to lay the infrastructure for North American integration. This allows for change with little or no public debate. Media were excluded from the September forum, and Day, who gave a speech at the event, declined to reveal its contents. Many of the attending politicians have been pursuing “integration by stealth” for the past two years, she said, pointing to a little-known but top-priority agreement called the Security and Prosperity Partnership. Don't like it. Don't like it one bit . . . . This video just released by VANOC the Vancouver 2010 Winter Olympics organization. Gives you a great pictorial of our future home. Book your hotel rooms now . . . .
Too Little, Too Late . . . . STILL no news on the immigration front, so we continue to post political ramblings. Believe me, I would much rather be posting something like: "Word from CIC", or "Interview Waived". Alas, it is not to be - today, anyway. By Joshua Holland, AlterNet. Posted February 2, 2007. Also this week, we learned that General George Casey, the former commander of U.S. forces in Iraq, had requested half the number of troops Bush ultimately requested (Casey originally opposed any increase in troops). At the same time, we learn that the "surge" was a bait-and-switch; a new report by the Congressional Budget Office found that Bush's request for just over 20,000 combat troops would require a deployment of as many as 28,000 additional personnel, including support and logistics troops and contractors. According to the Washington Post, "That could mean the plan would involve up to 48,000 troops and contractors, at a cost of between $9 billion and $13 billion for the first four months and up to $27 billion for the first year." The report contradicts testimony given Congress just last week by the army Chief of Staff. So when Bush asks America to give his plan to send 21,000 troops to fortify Baghdad and help train Iraqi security forces "a chance," what he's really saying is, 'regardless of what Congress, the American people and the Iraq Study Group want to see happen, I will send 50,000 under-equipped troops into the meat-grinder so that they can more effectively arm and train Shiite militias.' This, while the administration steadfastly refuses to engage in a parallel diplomatic push with Iraq's neighbors -- one that might give the plan some small chance of success -- choosing instead to rattle its saber towards Iran. Senator Chris Dodd responded to all this by saying: "This is the United States Senate. This is not some city council somewhere…It seems to me sending something down that engages the president, that forces the administration to pay attention is something we ought to be considering." Russ Feingold added, "A political victory is not more important than ending this war," and he's right. With an attack against Iran seeming ever more probable, this is the time to lay down hard constraints, to cut funding for Bush's escalation, demand he seek Congressional authorization to spread his conflict beyond Iraq and move towards ending the occupation. Anything less at this point is too little, too late. Personally, I've got to agree with the very last sentence. Our elected "leaders" need to actually "lead" us out of this mess . . . .